Breast cancer is the main cancer among women. It is estimated that 1 out of 8 women will suffer this cancer during their lifetime. But the good news is that it is also one of the few that can be diagnosed early, and breast self-examination is a very powerful tool that we all have in our hands to prevent and protect ourselves. But, do you know when is the right time to do it? How to touch yourself? And what things to look for? Research confirms that breast self-exploration remains as one of the main pathways for the early detection of breast cancer (1), but also “how” it is performed has a great impact on its efficacy, especially in terms of regularity and technique. That is why in B-wom we have decided to accompany women in creating this habit with a new feature, free for all users, because we truly believe that it is a tool that can impact on the early detection and women’s health. Update and the app and start! Why is breast self-exploration so important? This is due to the fact that mammography is not a perfect method: it can bypass about 20% of breast cancer cases because they are not visible by this technique (false-negatives). This occurs mainly in women under 50, since their breast tissue is still very dense and can make it very difficult to detect a tumor. That is why other complementary tools such as self-examination, clinical breast exams, ultrasound or MRI can and should be used. The use of these methods will be determined by the doctors according to each person’s level of risk and situation (depending on age, genetics…). However, breast self-examination is a practice that all women have in our hands to help us have an early detection in case of breast cancer. No matter your age or your level of risk, or if you get regular mammograms. Breast self-examination is prevention and self-knowledge of your body, kind of a way of saying: “everything that is in my hand, I´ll do it”. We have been thinking a lot about how to help you create this habit and keep it simple, effective and smooth. This is what we have done! Frequency is the key, and we take care of reminding you when to do it so you can easily integrate the habit in your life. How? In your Timeline section and with an email. 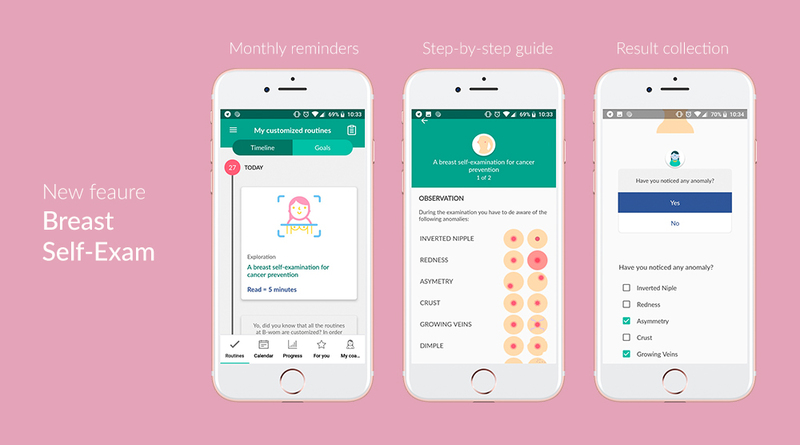 Later, the app will notify you at the right time according to your menstrual cycle. A website says one thing, a video on YouTube another, where is that f***ing flyer he doctor gave me?.. Don’t worry, now in B-wom you have a guide created by specialists that tells you how to observetouch yourself and what you shuld pay attentionon, easily and step by step. Also in the same app you can keep track of your self-exams and record if you have noticed any anomaly to communicate easily and clearly to your doctor. Update the app now and start creating this habit. Breast self-examination is prevention and self-awareness of your body. Don’t let this just as in the pink bows of October! (1) Roth, Mara Y. et al. “Self-Detection Remains a Key Method of Breast Cancer Detection for U.S. Women.” Journal of Women’s Health 20.8 (2011): 1135–1139. PMC. (2) Philip, J. et al. “Breast Self-Examination: Clinical Results from a Population-Based Prospective Study.” British Journal of Cancer 50.1 (1984): 7–12. Print. Hola! Gran artículo. Todo lo que sea en la lucha contra el cáncer de mama es una buena noticia. Un saludo!